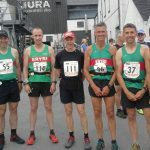 8 Eryri Harriers travelled in a number of different ways by land and sea to the beautiful Isle of Jura this weekend and faced the notorious Paps! The iconic 17 mile 2300m+ course is rough and rocky with lots of scree and bog to keep you working hard, and can be tricky navigating if the weather comes in – however we were quite lucky this weekend and mainly had warm and very humid conditions to deal with. Matthew Fortes was first Eryri home in a sub 4-hour whiskey-glass earning brilliant run which also gained him 2nd V40 and 3rd overall vet. 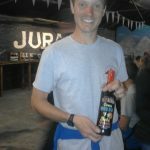 2nd home for Eryri was Adrian Williams who post-injury was flying despite part of his shoe falling off, followed by Jonathan Moore improving his time for the course, with strong runs also from our other Jura race regulars Paul Jones, Tim Watson and SPJ Stephen Jones (who ploughed round the course despite suspected cracked ribs!). Great effort guys! First timers Becki Law and Lou Beetlestone also represented the Eryri ladies – huge well done to Lou who had a strong start but unfortunately ankle problems meant she had to retire after the first pap and walked safely back in. I was last Eryri home in just over 6 hours but very happy to have got round – it was a really good day out and hope to be back! Thanks so much also to Nic Kirby who waited at the last checkpoint, cheering, handing out Haribo and guarding trainers and water bottles. 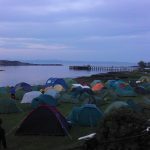 Hope to be back next year – well done everyone – really great weekend, including beers in the pub! There’s a reason people keep returning year after year, it’s all very welcoming and friendly, well-organised and definitely a challenge for the list! Event website here for info if you are interested in doing it and I’m sure official results will be here soon too:http://www.jurafellrace.org.uk/. Gweler canlyniadau Râs 10k Rhostryfan ynghlwm. The organiser apologises that the times announced at the presentation were a whole minute faster than the actual time due to problems with the main stopwatch. Despite that, Tom Roberts’ new record of 34m 35s still stands, as he has improved on the previous record held by Gwyn Owen by 4 seconds. 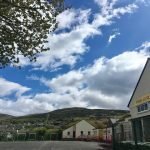 After the recent rains had gone the sun was shining on Moel Wnion and even with other local road races in the area as well as the Yorkshire 3 Peaks on the same weekend if was great to welcome 64 runners to Ysgol Llanllechid for the race. A great day seemed to be had by all (well I enjoyed myself) and some amazing performances were on display across the categories. Congratulations to Chris Richards (Bangor Uni) and Becki Law (Eryri) (1st M & F), Sam Orton and Ruth Metcalfe ( Both Eryri V40s), Russell Owen (Eryri) and Ali Thomas (v50s), Derek Weaver (Eryri – v60) and John Morris ( Buckely – v70). Chris tore up the course (quite literally given the state of his legs when he crossed the line) in 35.28 closely followed by Callum Davidson (also Bangor) in 36.03. These guys were running seriously quickly in their first wnion race, no surprise when you hear that they are ex-England juniors and current U20 runners going for GB vests, and reckon they can go quicker next year now they know the faster lines (if they dont face plant)! In the womens race, Becki Law seemed to be demonstrating the benefits of a winter at altitude by flying down the cart track to win in 47.23 ahead of Gemma Moore(48.55) and Ann-Marie Jones (49.22). Thanks to the long list of people who helped up on the hill and to everyone at the school. The race is run with the school as a fundraising event, with lots of people from the local community giving up their time to help with children’s races or help in the kitchen as well as marshal the main race. The prizes also came from the area, with the Bethesda Pottery shop making bespoke mugs and goblets. Once again, it was a great day for the local community, with everyone already looking forward to next year!